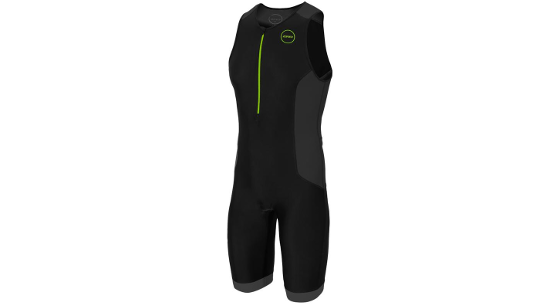 The Aquaflo Plus trisuit was designed by Zone3 with the amateur triathlete in mind who is beginning to get serious about their training and racing. This trisuit comes with technologies that allow you to enjoy your experience whilst also putting in a great performance. 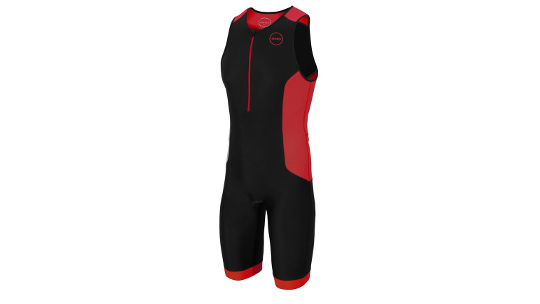 This trisuit is recommended for use in Super Sprint, Sprint and Olympic distance triathlons. The Aquaflo technology features hydrodynamic properties that help water to repel off the suit, allowing you the freedom to race without being weighed down. Balanced compression throughout the trisuit increases venous blood supply, reducing the build-up of lactic acid, helping you to perform faster for longer. Finally, Zone3's Tri-Lite-Pad offers enough protection for you to remain comfortable on the bike but does not over-absorb water from the swim or from your sweat, keeping you feeling comfortable and race-focused. Aquaflo is a fast and comfortable fabric. It is designed to give low levels of drag thanks to its water repellent Teflon coating. You will notice that when the fabric has water splashed on to it, it will bead up and flow straight off the suit. This hydrodynamic effect is maximised during the swim helping to achieve faster times. Provided through the legs thanks to a carefully designed panel shape and the high denier rating of the Aquaflo fabric. This improves muscle support and helps to increase the blood flow away from the legs, therefore reducing the amount of lactic acid build up and helping to improve your endurance and stamina. Designed for optimum temperature control by allowing moisture to easily evaporate from the skin and help keep the body cool or warm depending on the conditions. The soft-touch feels extremely comfortable against the skin and the eyelet pattern also helps the fabric to dry quickly after the swim.